Synopsis: Maleficent explores the untold story of Disney’s most iconic villain from the classic “Sleeping Beauty” and the elements of her betrayal that ultimately turn her pure heart to stone. Driven by revenge and a fierce desire to protect the moors over which she presides, Maleficent (Angelina Jolie) cruelly places an irrevocable curse upon the human king’s newborn infant Aurora. As the child grows, Aurora (Elle Fanning) is caught in the middle of the seething conflict between the forest kingdom she has grown to love and the human kingdom that holds her legacy. Maleficent realizes that Aurora may hold the key to peace in the land and is forced to take drastic actions that will change both worlds forever. Review: You may not know it from the official trailers, but Maleficent is both a kid- and family-friendly film. To say more would be slightly spoilerly, but this mismatch presents the biggest stumbling block for the film – that many viewers are going to watch the movie with the wrong expectations in tow. Given that the film is trying to flesh out the backstory of one of Disney’s most famous villains, and integrating that into one of the most famous “old-school” Disney animations, first-time director Robert Stromberg has a lot to achieve in a very short amount of time. It’s not entirely successful, and in a way it almost feels as though the original Sleeping Beauty had put some shackles around the way the movie unfolds, but almost all is forgiven solely by the extremely astute casting choice of Angelina Jolie as Maleficent. Producer Joe Roth seems enamoured with films that retell a familiar story, including Alice in Wonderland, Snow White and the Huntsman, and Oz the Great and Powerful, and Maleficent is a film cast in a similar mould. For Maleficent, unfortunately, it really has been done before (and arguably better) in Wicked, which means that there are very few surprises to be had here. In fact, the attempt to run a parallel story to the original Sleeping Beauty doesn’t nearly work as well as it should, because the film is simply too short to allow for more depth in the storytelling. The final third of the movie feels extremely rushed, as though the fact that this is a family movie means the running length can’t exceed 90 or so minutes (two words for Disney to consider: “Harry” and “Potter”). It’s almost hilarious how little time Aurora spends caught in her magical slumber, that it feels more like a quick nap than anything else. It’s things like these that make the links to Sleeping Beauty feels perfunctory, especially because there appeared to be a need to recreate certain key scenes from the alternate perspective. However, there’s no denying that Richard Stromberg had realized a wonderful world in Maleficent – the art direction and set design (despite there being only two main sets in the film) is flawless, and the visual effects are extremely well done. This isn’t surprising, given Stromberg’s CV before taking the helm, which includes two Oscar wins for Art Direction for Avatar and Alice in Wonderland. However, once again this is a film that doesn’t require viewing in 3D – there were scenes that should have looked better without 3D glasses on, and the already dark scenes look even murkier in the third dimension. 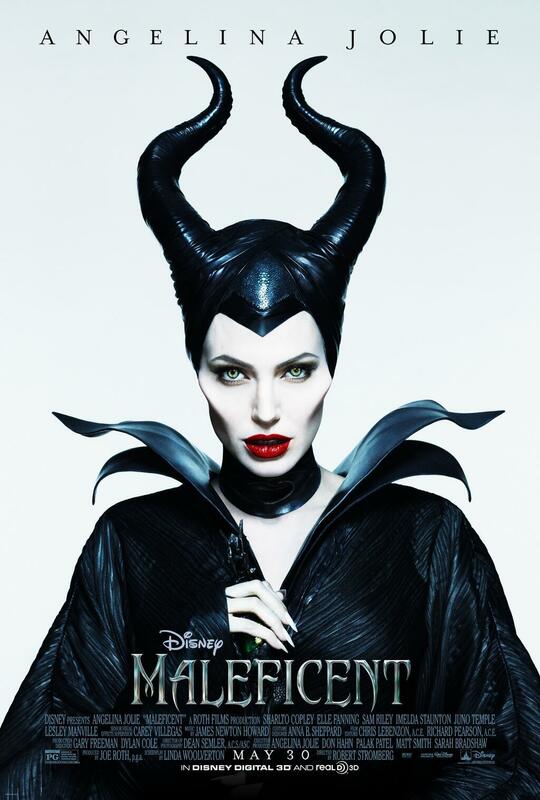 There is no doubt that Angelina Jolie totally owns the Maleficent character. She’s terrific in the role, all regal and menacing, her already distinct features made even more angular by Rick Baker’s incredible makeup. Her screen presence overshadows everyone else in the film, to the point that she is really the only character that matters or has any semblance of depth. This could be a good or bad thing depending on your perspective, but let’s get real – everyone is here for Angelina Jolie/Maleficent, and her performance does not disappoint.